I like that author finally realized the real nature of the egocentric president… deep inside he sees himself as the new Inca… transcending existing boundaries between countries. His megalomania is such that he forgets he is an Aymara, and as such he could never aim as being the Inca, he is no Quechua… nor does he speak any of those languages. Even Galeano expressed his error for his famous writing that boosted the Chavez, Maduro, Correa, Ortega, Castro, Lula, Kirshner, Morales of Latin America. These individuals have wasted the best economic times in our history, Venezuela is falling down the cracks, now the prices of our export commodities continue to fall and they insist on their crooked “ideals”, that only benefit heir pockets. 1) Over a decade lost and $150 billion dollars wasted. 2) Almost 800 Bolivians fled the country due to political persecution and a non-existent unbiased justice system. 3) Dozens of Bolivians lynched under the so-called “community justice”, current masismo promoted anarchy at all levels. 4) Increasing violent murders due to narcotrafficking. 5) Smuggling contraband, useless-pollutant vehicles and precursors for cocaine have contaminated the lives of rural towns across the country. La Paz, 22 January 2006. Evo Morales Ayma was born Aymara and poor in the department of Oruro. For lunch he and his father would scrounge the thin meat from orange peels cast from the windows of passing autobuses, and his most ambitious childhood dream was to ride in a bus. During his life he worked as a baker, brick layer, farmer, trumpet player, and soldier; then rose up through the ranks of coca-farmer unions to become a leader of El Comité de Coordinación de las Seis Federaciones and finally of the Movimiento al Socialismo (MAS). It is for such humble beginnings that his election to the presidency of the poorest country in South America was of so much interest to Tom Hayden that he convinced me to travel to the transmit del mando in 2006. The truth is I didn´t want to go, although I admit that I was impressed: between the election and the inauguration Evo was already traveling the globe lining up potential allies—and doing so garbed in the ratty, old red-and-blue pullover that he became known for. His vice president had been a guerrillero in the Tupak Katari Guerrilla Army, and his First Lady would be his sister, a vegetable vendor. At the time we in the U. S. of A. were in a decidedly Eeyore state of mind. George W. Bush was busy dishing out his deadly brew with a neoliberal serving spoon and spitting out such indigestible scraps as:“I don’t listen to focus groups. It doesn’t matter if you mass a million, billion, six billion people or whatever. It doesn’t matter. It doesn’t matter.” Despite the official claim that the global corporate economy was providing a miraculous boost to Wall Street, for those of us at Ground Zero, the fissure between rich and poor was cracking apart like the San Andreas Fault. Not to mention the rollback—or out-and-out demolition–of the rights and equalities we, our parents, and grandparents had fought for. And so it was with an unforeseen boost to my waning sense of possibility that I was lifted to the altiplano skies by the exploding spirit of the Bolivian people.In Plaza San Francisco, where in the past syndicates and citizens had gone mano-a-mano against the military,they were now awaiting the arrival of their new leaders. Beaming Aymara women in bowler hats. The street kids rehabilitated by El Teatro Trono atop stilts made of scrap wood, gyrating to the thunder of homemade drums. Quecha women in their flat-topped straw monteras. Miss Bolivia Universo. Bigger-than-life eagle puppets. Charango players and marching bands. Dance groups in huge head dresses. Bolivia’s glorioustrícolor, blue MAS banderas, multi-colored wiphala flags– all flapping like foam caps atop a sea of humanity. Suddenly Eduardo Galeano materialized on the stage. His gravely voice bouncing from one end of the plaza to the other, he proclaimed that Evo’s presidency marked the end of “la dictadura de miedo”/the dictatorship of fear. Next came Vice President Álvaro García Linera. “Una pollera, una falda, un poncho — lo mismo que una corbata…Todos los bolivianos debemos ser iguales,” he announced. A cholitaskirt, a simple skirt, a poncho–they are the same as a necktie … All Bolivians should be equal. Then Evo…and the crowd stilled like ahunk of granite on Illimani. The once-coca farmer, now decorated with the medallion of Simón Bolívar, pledged unprecedented striving for justice–and the sky opened to a downpour as thousands of Bolivians were drenched in hope. My own inner ascension could not have soared any higher… until Evo´s next words: “La lucha que dejó Che Guevara, vamos a cumplir nosotros”/We will finish the fight that Che Guevara started. La Paz, 22 January 2015. In the early years it wasn’t kosher to critique the breakthrough presidency. From that stretch of time until 2011´s police violence against indigenous marchers in Chaparina, resulting in the first appearance in print of words like “dictatorship”; from the building of mega-iron mines, gas pipelines, and lithium factories through the launch of the nation´s own Chinese-made satellite, the announcement of Iran-funded uranium mining and nuclear power, and the initiation of a super-highway through constitutionally-protected native lands/nature reserve to transport Brazilian commodities to Chilean ports; and including rings of corruption within the administration, police authorities condemned for cocaine trafficking, execution-style killings of opposition proponents, and constipation of judicial action on cases embarrassing to the Palace—it has been a wild ride. 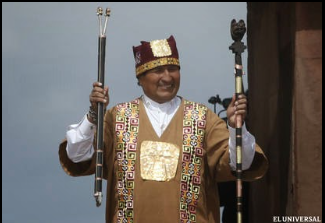 Perhaps no event could be more illustrative of the paradoxes of Bolivian politics than when the very amauta/medicine-man who conducted the 2006 spiritual purification at Tiawanaku honoring the altiplano´s first indigenous leader in 500 years was jailed for running a cocaine purification factory in El Alto. I decide to head to La Paz to see how the inaugural ambiance has changed in nine years. And it has. The atmosphere of spontaneous fiesta–long replaced by the work of planning, passing laws, building institutions, and making policies—has given way to a continuation of support, yes–but support less spurred by heart-felt release than by a conscious effort organized, regulated, and controlled by the government. Curiously no one seems to know what is happening. The concierge at Hotel España doesn´t know, newspapers give no indication. Just as I did in 2006, I watch the official transmission on TV in my room. When it´s over, as in 2006, I head out to Plaza San Francisco. Not a soul is there, rather the action seems centered in the Plaza Murillo where the Palace, National Assembly, and site of Evo´s proposed multi-storied super-heliport prevail. But the people are not allowed in; the entire area is encased by a police barricade with SWAT teams cruising the periphery in open trucks. Instead of an air of celebration, there is frustration. I situate myself at Calle Comercio and Sanjines and watch waves of people puff-and-pant up the steep street, turn around, and descend. I see one lone miner in his best for-show hardhat. Here and there an amauta in traditional dress, his magic stick in a tube on his back. Whole branches of bananas and wooden boxes full of tomatoes are heroically lugged up, only to be turned back. There is no connection between people, no village clans, no music generated from the celebrants; this time the government is in charge. Then something out-of-the-ordinary takes place. I cannot give details as to how it happens—perhaps as the result of somebody´s magic stick?—but director of Teatro Trono Iván Nogales and I are inexplicably swept through the olive barricade to the other side. And suddenly we are charged with carrying the Comité Cívica Juvenil de Oruro banner and, a cadre of red-coated military musicians blasting trumpets and drums at our backs… we are marching straight into Plaza Murillo where Evo Morales, Álvaro Garcia Linera, various Latin American, and Bolivian officials await the exhibition of citizen support. For those participating in this spectacular pageantry, is it a full-on basking in achievement and hope? Or is it attraction to pomp and power? Or required participation? For sure, the celebration is no longer 2006´s spontaneous expression by the joyous citizens who fought for years to upend the dictatorships. But is it now the captive of what some activists and intellectuals are calling “autoritarianismo”? Or is it a true reflection of what others assert is “the best presidency in Bolivian history”? Colonization, empire, and the corporate global economy generate paradoxes within both exploited and perpetrator that few have yet figured out how to resolve; it seems rather that humanity has been irretrievably damaged–and impossibly ensnared. Take, for instance, the requisite to construct a nation-state strong enough to survive militarily. Ergo: Evo´s formerly victimized Bolivia launches a campaign of military fortification–acquiring new fighter planes, updated weapons, satellite technologies; crafting relationships that crisscross political boundaries from Iran, China, and Venezuela to Australia, Japan, and perhaps now the United States; requiring military and police to sign oaths to defend socialism; and launching public campaigns to inculcate nation-state patriotism. Take the economic fact that Real Politic offers no alternative to survival other than tooth-and-nail competition within an out-of-control global economy. Wanton exploitation of natural resources, mega-industrialization, canals and superhighways, robots and drones–and mass fabrication of horror-filled Halloween masks to sublimate the panic that such unrestrained development produces. The wars rage on. Palestine, Iraq, the Congo, Syria, Nigeria—as the age-old and ongoing battle to steal/dominate/wreak-vengeance/recuperate persists, and millions of sentient beings give their lives to campaigns-for/resistance-against imperial pursuits. So, too, economic development of an exploitative, mass-commodity-based bent. Whether classical, modern, or postmodern, its unlimited expansion is killing bees and lemons, oak and molle, seas and rivers, the sky, the oceans–just as it leaves a moon scattered with trash, the tops of mountains lopped off, and tomatoes mixed with the DNA of fish. Not to mention the demolition of cultures, communities, and countries. And Evo Morales—his ratty sweater now replaced by a designer jacket, his longing to ride in a bus fulfilled by helicopters and jets–is not immune from its demands and contradictions. Chellis Glendinning is the author of seven books, including the award-winning Off the Map: An Expedition Deep into Empire and the Global Economy and Chiva: A Village Takes on the Global Heroin Trade. She is currently working on a book in praise of activists, thinkers, and artists she has known in social movements. She can be reached via her website http://www.chellisglendinning.org. This entry was posted in Bolivia, Business, Crime and Violence, Drug war - narcotraffick, Economics, Holidays, Mining, Politics, Social Unrest, TIPNIS and tagged anarchy, bad politics, coca grower, cocaine production, demagogue, Ochlocracy, public policy failures. Bookmark the permalink.